The Marching Abominable is turning 45! We’re celebrating our Sapphire anniversary, and all Abominables past, present, and future are welcome to join the festivities! 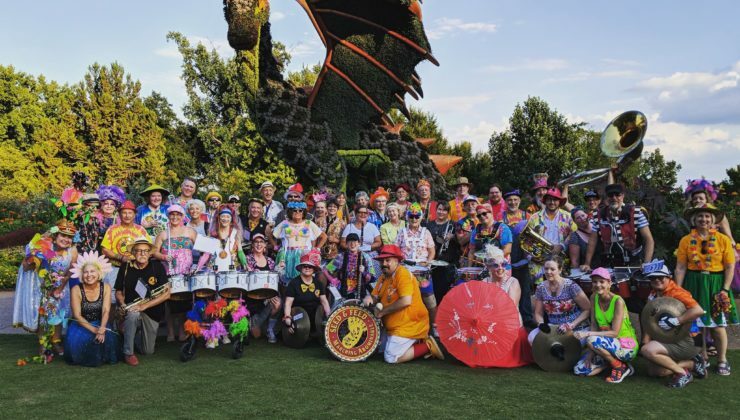 Dust off that horn, grab all your beautiful blue glitter, feathers, sequins, and all things Abominable and make your way to the 2019 Inman Park Festival! Please RSVP (even if you are an Active Abominable) in the form below or click here. 6:00 pm – Kick off the weekend Friday night at the Welcome Reception at the Band Room. 7:00 pm – Blow the roof off the Band Room at the 45th Anniversary Rehearsal. 9:00 pm – Blitz our neighbors at the Inman Park Butterfly Ball. The costume for the Butterfly Ball is Faux Formal and be sure to bring the lights! Playlist to be announced. 10:00 pm – Meet up with fellow Abominables at Manuel’s Tavern for merriment and libations. Incorrigibles: Please leave the Incorrigibles (children of the Band) at home for tonight! We would LOVE to see them on Saturday! Directions: From 75/85, exit Freedom Parkway. Follow Freedom Parkway (bear right at both forks in the road) until it dead ends into Moreland. Take a right onto Moreland and go to the third traffic light. Turn right at this light onto Euclid. Just past the second light on Euclid, turn left into the Center’s parking lot. 2:00 PM – Step off for our 45th Anniversary performance at the Inman Park Parade! Playlist to be announced. Costumes: The costume for the parade is your Sparkliest Sapphire Blue Finest. Why sapphire you ask? Traditionally 45th anniversaries are celebrated with sapphires! Pull out the glitter, the sequins, the sparkles, the feathers, and more. Let your imagination run wild! Keep in mind – this is a family oriented affair so keep your dainty bits covered and costumes non-offensive. Parking: The parade starts at Edgewood Avenue & Spruce Street. The parade ends at Euclid Avenue and Austin Avenue, directly in front of the band room. Best place to park is the band room and then walk the 3/4 mile to the assemble point. The police will eventually block the entrance to the L5PCAC and sometimes it’s difficult to get past them. Consider arriving at the band room before 1:00 PM. The band room will be open starting at 9:30 am. Pro-tip: Marta, Lyft, Bike or Carpooling are even better than driving your car to the Band Room. Standstills: The band will do a standstill performance in the park with our friends the Atlanta Freedom Band after the parade. Listen for announcements immediately before or after the parade for details. Be Prepared: Plan on walking about 2 miles Saturday on what is usually a warm spring day. Rest rooms might be few and far in between. The rest rooms at the L5PCAC will be open. Stay hydrated, wear sunscreen, and keep your feet happy with comfortable shoes. Incorrigibles and Guests – Incorrigibles (children of the Band) and guests are welcome to attend!!! You are responsible for their safety. Please be sure to put them in something with a Seed & Feed logo so we know they are with us. If they are willing to help out please let us know! Volunteers – If you or your guests are willing to volunteer on Saturday to help make the day a success, please sign up here. Turn left out of the front entrance of the L5PCAC and walk down Euclid Ave (southwest bound) 0.75 miles to Spruce St. From there you should be able to tell which way the parade is lining up. We are usually near the front of the parade. Walk down the line until you find us. You’ll be walking through the festival crowd and tents to get to the parade. Allow 20 – 25 minutes to walk from the band room. If you have mobility issues – talk to Donna so she can try to work something out for you. The parade route is Edgewood Avenue at Spruce Street, following Edgewood to Hurt Street, Hurt Street to Euclid Avenue, and ending at Euclid Avenue to Austin Avenue (directly in front of the L5PCAC). The parade route is approximately 1.5 miles. Wear comfortable shoes. Questions: Please email Donna Weber, Mouth at mouth@seedandfeed.org. Bring your favorite breakfast dish or snack to share to the Abominable Inman Park Potluck Brunch. There will be coffee, tea, and juice for you to enjoy. For those who were members in the 70s, 80s, or 90s, this brunch is a chance to gather with those who also remember what a wonderful time we had. Room 105 will be open for you to relax and reminisce. All are welcome to attend the brunch and hear all about the memories of the band. Feel free to bring old band bling as well as memories. And remember, if you are driving it is easier to find parking if you arrive early. All band members past and present are invite to the 45th Anniversary Abominabash party! Join all of your fellow Abominables for an evening you won’t forget. Put on your dancing shoes and get ready to boogie the night away. Join us for dinner, drinks, and dancing. Featuring music by Rockit 88!!! Not a fan of dancing? That’s ok! Come relax and reminisce. Plus ones are welcome but please leave the incorrigibles at home. Please note – as much as we love the general public, this party is only open to past and present Marching Abominables and their guests. Thanks!!! Menu: Food, beer, and wine provided. Please let us know if you’ll be attending the celebrations for the 45th Anniversary! We cannot wait to see you! To make sure we have enough supplies for everyone we would love to get an estimated headcount of attendees. Please fill out the form below (even if you are an active Abominable) so we can get you all set up. Thanks!!! What 45th Anniversary events will you be attending? Sorry to miss it! Will be there in spirit! If you are attending the AbominaBash, will you be bringing any guests? If so, how many? Would you like to receive email updates in regards to the 45th? Comments/Questions – Please let us know! Questions – Please contact Donna Weber, Mouth at mouth@seedandfeed.org.